It's not the kind of headline women's mixed martial arts contender Julianna Peña wants to attract as she vies for her chance at a title shot in the UFC's women's bantamweight division. Reports from sports outlets online are saying that the sixth-ranked fighter in the 135-lb. women's division was booked into Spokane County Jail early Sunday morning on two counts of assault after getting into a fight outside of a downtown Spokane bar. Spokane Police Department spokesperson Officer Teresa Fuller says a call came in early Sunday morning at around 2:20 am that Peña had allegedly assaulted two employees at Zola on West Main Avenue after the employees denied Peña's request to enter the bar, which was closed, to use the restroom. She was reportedly with a male companion at the time. 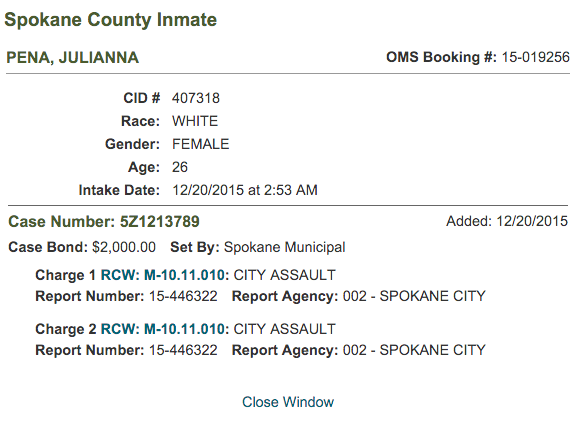 A screenshot of Pena's intake report from the Spokane County Jail. Peña has since been released on a $2,000 bond. It hasn't been announced whether the UFC will consider any disciplinary action against Peña, who last fought and won in an October match-up against Jessica Eye. The Spokane-based athlete spent all of last year recovering from a major knee injury. Since her return, she has been victorious in both UFC fights she's competed in this year. Peña trains at Sik-Jitsu in Spokane with coach Rick Little. The training camp also is home base for UFC athletes Elizabeth Phillips, Mike Chiesa and Sam Sicilia. UPDATE: Here's what reporting SPD officer Chad Herzog filled out on the incident report filed with the department. "On 12/20/2015 at approximately 0220 [redacted] were closing up the bar at Zola's [sic] where they work, when Julianna and Josh came to the door requesting to use the bathroom. [Redacted] told them they could not use the restroom and Julianna became enraged. She lunged towards [redacted] who then pushed her towards the door. At the door, Josh began trying to hold Julianna back, when she kicked both [redacted]. [Redacted] said that she kicked him twice in the groin. While I spoke with [redacted] Corporal Kakuda interviewed [redacted]. I advised Cpl. Kakuda of [redacted] statements. Cpl. Kakuda advised that he had PC to charge Julianna with two counts of City Assault (based on [redacted] mutual statements)."